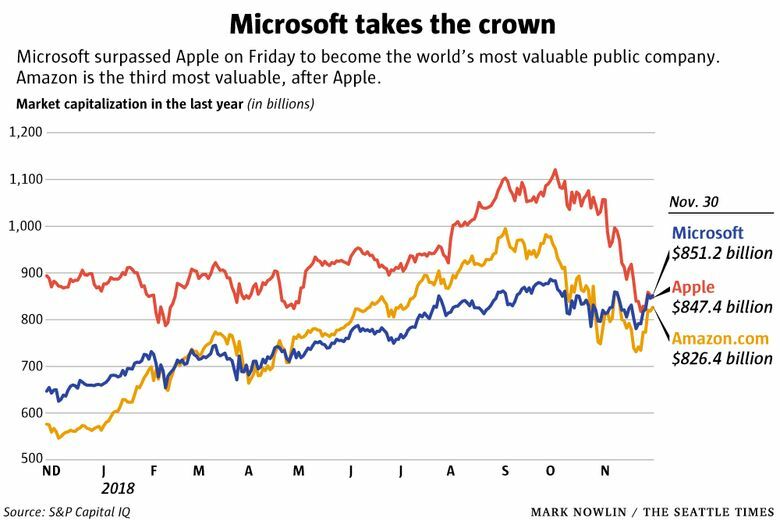 Microsoft closed stock trading Friday with a market value of $851.2 billion, topping Apple's $847.4 billion and making the Redmond company the most valuable publicly traded company in the world. The Redmond tech giant, which had briefly overtaken Apple’s market capitalization in intraday trading earlier this week, finally closed at No. 1 on Friday, when Microsoft’s stock price climbed 0.6 percent, giving it a market cap of $851.2 billion, while Apple’s stock dropped 0.5 percent, pushing its value down to $847.4 billion. The last time Microsoft’s market capitalization was bigger than Apple’s was in 2010, according to data compiled by Bloomberg. Microsoft hasn’t been the most valuable company since the height of the dot-com boom in 2000. One could be forgiven for having overlooked Microsoft’s steady climb back up the stock charts. The company exited its failing smartphone business years ago and, save for a couple remaining hardware products, has focused almost exclusively on technology that serves corporate customers. Much of its moneymaking businesses aren’t flashy and aren’t focused on consumers, and so have stayed out of the limelight. But Microsoft’s chief strength — its cloud computing service, Azure, which allows companies to rent its computing power — is booming as the backbone of the tech industry, and has grown significantly under CEO Satya Nadella. “I think it just speaks to what a cloud behemoth they’ve built in Redmond,” said Daniel Ives, a technology analyst at Wedbush Securities. 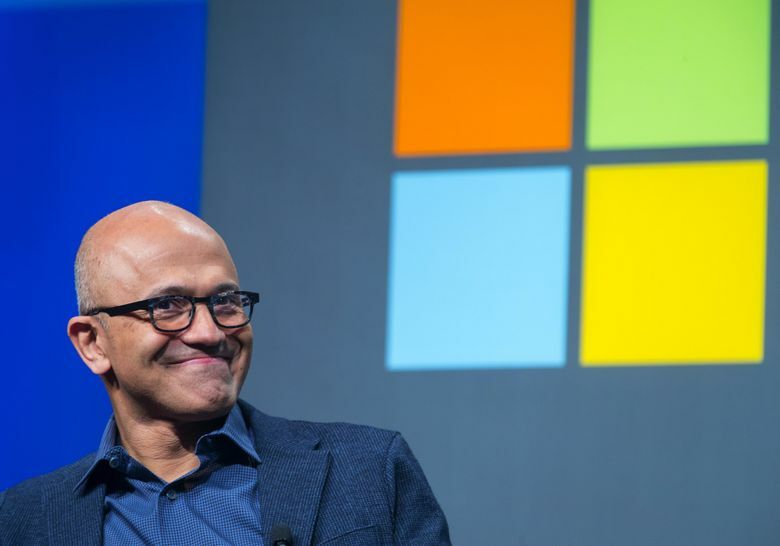 Microsoft’s commercial cloud business, which includes both Azure and cloud-software such as Office 365, brought in $8.5 billion last quarter, a 47 percent increase from the previous year. The steady climb of Microsoft’s stock this year may have been overshadowed by other top tech stocks — in particular Facebook, Apple, Amazon, Netflix and Google (collectively referred to as FAANG) — which soared earlier this year, only to fall steeply in the last two months. Apple, for instance, hit its 2018 peak in early October at $231.26 per share, up more than 38 percent from the start of the year. It closed Friday at $178.58, up about 7 percent year to date. Some of Microsoft’s top tech competitors have had a shaky year filled with contentious relationships with federal regulators and uncertainty over trade disputes, which has pummeled their stock. Facebook and Google have been caught in the cross hairs of legislators’ attempts to better manage consumer privacy. Apple has been hit by concerns that demand for its iPhones is declining, worries that were exacerbated when Apple recently said it would no longer disclose the number of phones it sells each quarter. The Cupertino, Calif.-based company and lifetime rival of Microsoft’s was dealt another blow this week when President Trump suggested he might put new tariffs on Chinese-made iPhones. Instead of getting tangled in regulators’ privacy concerns like some of its peers, Microsoft has positioned itself as a crusader for consumer privacy, calling for regulation of facial-recognition technology and establishing an AI Ethics board. At its annual shareholder meeting in Bellevue on Wednesday, CEO Nadella called attention to the company’s studies of artificial intelligence parameters. The company is asking “not what computers can do, but what should they do,” he said. Far from the days of Microsoft’s antitrust woes, the company seems to stand out — or rather, avoid the spotlight — as a pillar for corporate social responsibility. Information from Bloomberg News and The Associated Press is included in this report.